Thai authorities have issued arrest warrants for nine leaders of a protest in which thousands of demonstrators have occupied a government compound. Thai police have surrounded the complex in Bangkok, but the anti-government protesters are refusing to leave. PM Samak Sundaravej has ordered the police to end the two-day old protest, but has said he will not use force. 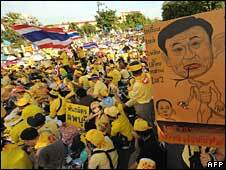 The protesters say Mr Samak is a proxy for former PM Thaksin Shinawatra, who was ousted by a military coup in 2006. Mr Samak, who is currently stationed in military headquarters, has rejected the protesters' calls for his resignation. Mr Thaksin is now living in self-imposed exile in London, after leaving Thailand earlier this month to avoid facing a series of corruption charges. 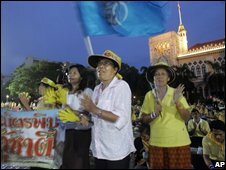 Analysts say that Thai society is deeply divided between those who will never trust an administration run by allies of Mr Thaksin, and those - particularly in the countryside - who are his ardent supporters. Public sympathy for the protesters - a group calling itself the People's Alliance for Democracy (PAD) - appears to be waning, says the BBC's Jonathan Head in Bangkok, but they are still well-funded and enjoy the backing of some very senior military and civilian figures. The army, in particular, is uncomfortable about being caught in the middle of this conflict, our correspondent adds. After news of the arrest warrants filtered through to the protesters, their leaders remained defiant. One of those facing arrest, Somsak Kosaisuk, a union leader from the south of the country, said he would wait for the police to arrive. "If you want to arrest us, come here and arrest us here - it is the government who must go," he said. 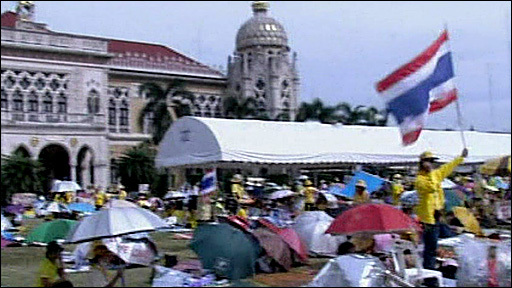 Earlier on Wednesday hundreds of riot police cut through makeshift barricades and moved into the compound around Government House. There were scuffles between the two sides, and a few minor injuries were reported. But the demonstrations were largely peaceful, with protesters posing for photographs, picnicking and singing. Many were clad in yellow as a mark of loyalty to Thailand's revered King Bhumibol Adulyadej. The king was reported to have asked that the protesters be treated gently, and Mr Samak said his approach would be "soft and gentle". The prime minister is clearly hoping that if the leaders of the PAD are detained, the movement that has harried his administration with its boisterous protests for the past three months will collapse, says our correspondent. The demonstrations started on Tuesday, with more than 30,000 people taking to Bangkok's streets. Masked supporters stormed the main studios of the government-run National Broadcasting Services of Thailand (NBT) and at least three government ministries, before converging on Government House. Mr Samak's government has a clear majority in parliament, and he insists he retains a democratic mandate from last December's election. The PAD formed three years ago as a movement to bring down Mr Thaksin but, despite its name, is actually campaigning for an end to democracy, our correspondent says. It wants a largely appointed parliament, and a legalised role for the military as a kind of referee in Thai politics, he adds.